Lt Col Harold Wyllie OBE RSMA (1880-1973). Attributed to Lt Col Harold Wyllie: watercolour unsigned (dated verso 1938/39). The well balanced lines of AJAX and her 4 sisters (LEANDER, ACHILLES, NEPTUNE and ORION were matched by the class' performance in service. 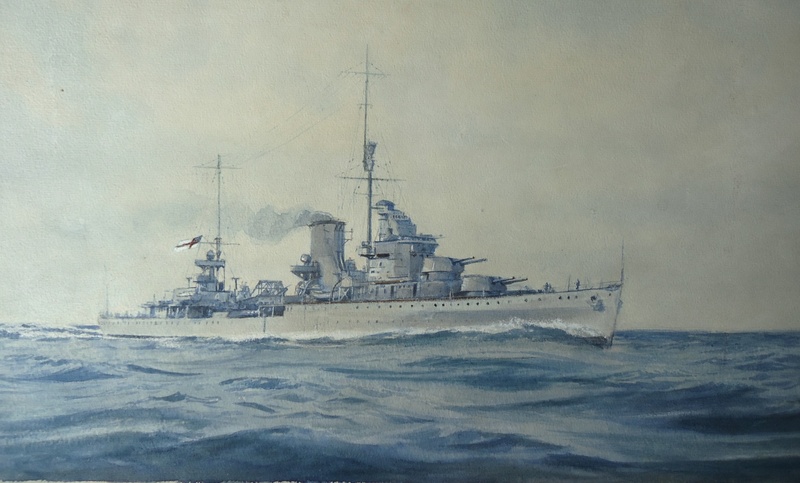 With their four twin 6 inch turrets they were regarded as successful gun ships with a good endurance, a handy 32 knots, a useful spotter plane and very reasonable living conditions - always important in cruisers who are required to be away from shore support and out at sea for many months at a time. Their symmetrical appearance was largely a result of the single trunked funnel which resulted from grouping all the boilers into one compartment amidships thereby, it was hoped, creating enough upper deck space to incorporate a hangar abaft the catapult: it was not to be. For their first few commissions and before the war they were found to be very employable on stations where long legs were required and thus they spent much of their time on the Americas and West Indies Station where distances were considerable and base fuelling facilities limited. They were independent commands for 4 ring captains and were undoubtedly very pleasant ships in which to serve! AJAX leapt to fame of course in December 1939 when in company with her Royal New Zealand Navy sister HMNZS ACHILLES and the 8 inch EXETER she succesfully out fought and then cornered in Montevideo, the German 11 inch pocket battleship GRAF SPEE. Further service for AJAX in the South Atlantic followed and then the class was mostly employed in the Mediterranean where the ships of that Fleet were being severely tested and losses were high: NEPTUNE was lost here to mine. One or two of the class saw service in the Pacific and after the war they were again stationed with the Mediterranean Fleet but by the late 1940s, worn out from their war service and victims of shrinking naval estimates, the surviving sisters, with the exception of ACHILLES, were paid off for disposal. ACHILLES, after a refit, was transferred to the Indian Navy in 1948 where she became INS DELHI: she gave a further 30 years of service - some 45 in total since first commissioning- before finally going to the breakers in 1978.